BS Yeddyurappa said HD Kumaraswamy has spent half of his days in office by visiting temples and the other half by passing time in posh hotels. As the Congress-JD(S) coalition government completed six months in office on Friday, Karnataka BJP chief BS Yeddyurappa said its survival for six months itself was a big success of the "non serious" Chief Minister HD Kumaraswamy. The government, he said, has neither any direction nor goal, and alleged that Mr Kumaraswamy has spent half of his days in office by visiting temples and the other half by passing time in upscale hotels. "The big achievement of this government, which has completed six months in office, is making false promises to the people. Its six months survival itself is a big success of Chief Minister HD Kumaraswamy," Mr Yeddyurappa said. He demanded to know why farmers were committing suicide 'on a daily basis', if the government, as claimed, had taken steps in the last six months to alleviate the suffering of the people. "Even today farmers committed suicide in Mandya and Kalaburgi. Most shocking is that the farmers who are committing suicide are holding the chief minister responsible for their deaths," he said in a statement. On Mr Kumaraswamy's comments that his government was a "child of circumstances", Mr Yeddyurappa said that as far as one's knowledge goes, a baby born out of circumstances would neither have any direction nor a goal to achieve. "This government, born out of circumstances, has non direction and goal. Surprisingly, the non-serious chief minister Kumaraswamy has spent half of his days in office by visiting temples and the other half by passing time in posh hotels," he added. On May 23, JD(S) leader HD Kumaraswamy was sworn-in as chief minister at a grand ceremony attended by a galaxy of top leaders and regional satraps in a rare public show of unity, perceived as a possible harbinger of a broad based anti-BJP alliance ahead of the 2019 Lok Sabha polls. The Congress and JD(S), which came second and third respectively in the May 12 Karnataka assembly polls, joined hands to form a government in the post poll scenario to keep BJP, the single largest party, out of power. Mr Yeddyrurappa said that the only 'achievement' of Mr Kumaraswamy was issuing statements, 'insulting' the people in general and the farmers in particular. "Power has gone to his head and has made him speak arrogantly and repeatedly say that if the situation warrants I will put in my papers and go home. This kind of statement is an insult to the people in a democratic set up," he said. Expressing surprise over Congress leaders' tolerance towards this "non-performing" government and the "arrogance" of the chief minister, who even bullied a woman farmer leader, 'asking her where she had slept for the last four years, he said the Chief Minister has disgraced women by saying so. Mr Kumaraswamy had clarified that he did not make such a comment to disrespect the woman. "What I meant was, "why have you woken up to that situation now? Were you sleeping?' I would never disrespect a woman. These are not farmers who are agitating but these are sponsored protests," he had said. 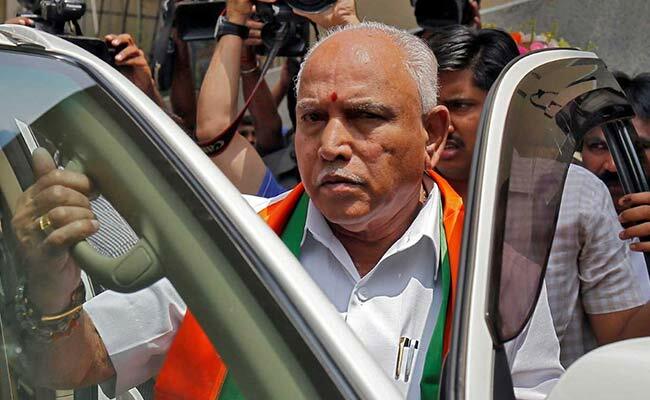 Mr Yeddyurappa said the Congress should be held responsible for all the 'failures' and 'follies'of the Chief Minister and added that people would teach the party a lesson in the coming days.